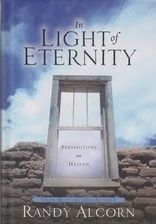 In Light of Eternity will grip your soul and open your eyes to the realities of heaven. Far from boring, heaven promises to be an exhilarating adventure in which every chapter is better than the one before . . . Let this book guide you into discovering how wonderful your eternal future will be -- and what you can do now to prepare for it.